MultiGrid smooths out the risk of grid instability and energy costs by utilising energy storage and self-consumption. MultiGrid, is the VDE-AR-N 4105 and AU 4777.2:2015 approved, CEC listed version of the MultiPlus. With Anti-Islanding built in, this makes it suitable for countries such as Germany, Austria and others. In the UK the MultiPlus is used, as it is approved to the G83/2 and G59-3-1 standards required there. Combined with the flexibility of a MultiPlus bidirectional converter The MultiPlus range of bidirectional converters is the worldwide product of choice on boats and vehicles to generate AC power, and to recharge batteries, either with shore power or an onboard AC generator. 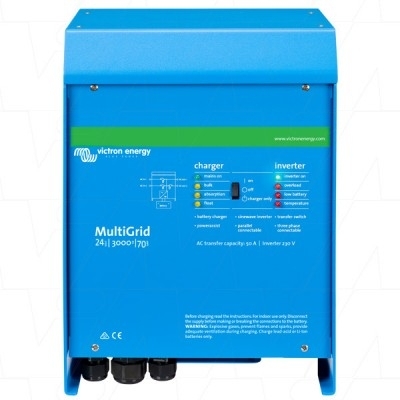 The MultiPlus also is the industry standard in on-grid and off-grid energy storage systems and is approved for use in energy storage and self-consumption systems in the UK (G83/2 and G59-3-1 standards). Several hardware and firmware modifications were needed to qualify for VDE-AR-N 4105 and several other country specific energy storage related standards. The resulting product is the MultiGrid. The MultiGrid fits seamlessly in all common energy storage topologies There is no one-size-fits-all solution to energy storage. The building blocks, topology and control systems will depend on local conditions and regulations.